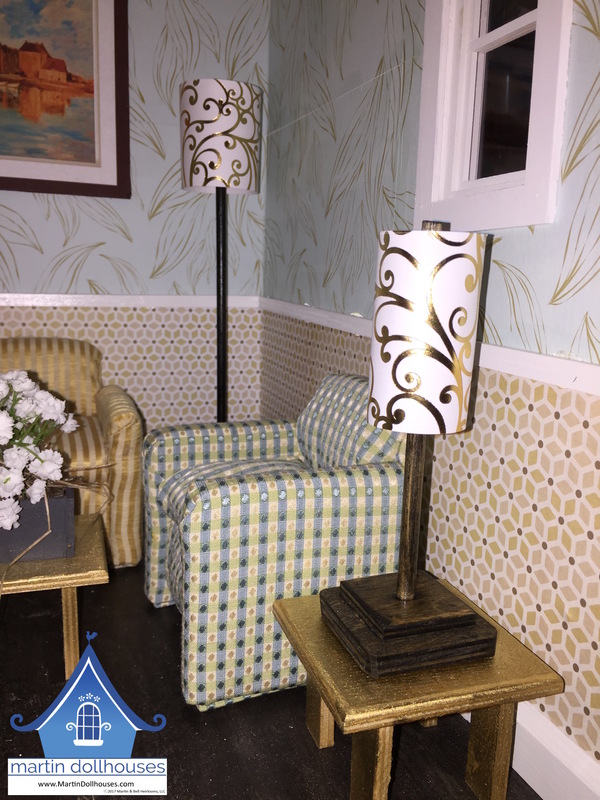 I’ve been playing with a Barbie dollhouse lamp a little bit. Years ago (okay a decade or two but who’s counting) this is what the designed looked like – sturdy enough for kid’s play but not very elegant. With some paint and some fabric it does turn out pretty nice. And it’s solid wood so it’s child-destruction tested. Here’s another version I recently completed. It was from this version that I added a paper shade and created what you’re about to see. 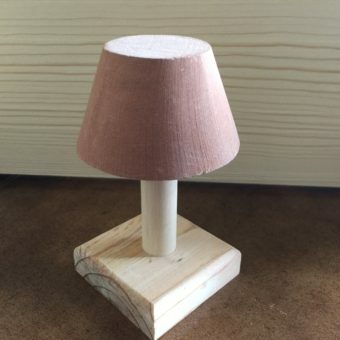 These Barbie dollhouse lamps are solid wood – birch and pine – but the “lamp shade” is not tapered. 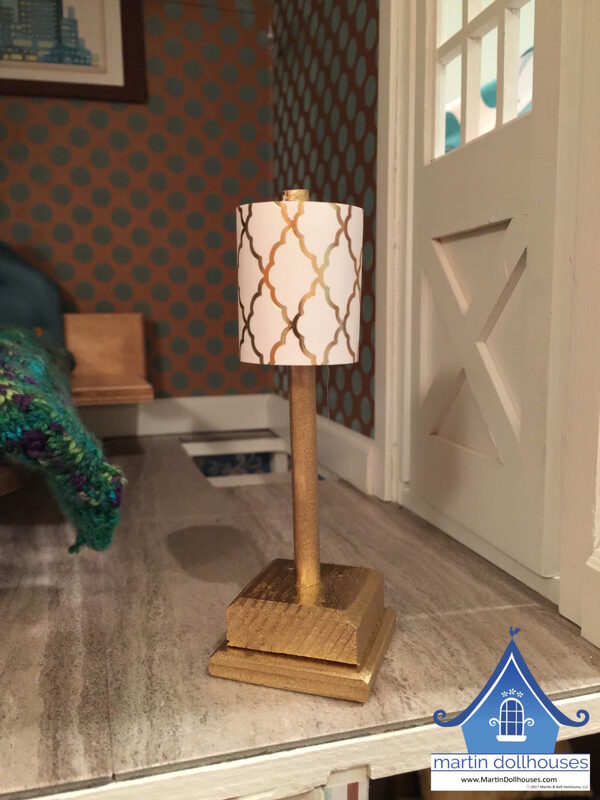 The lamp shade is wrapped with nice, heavy foil/gold paper. 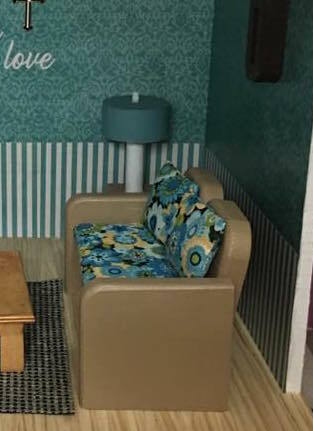 I like the way the floor lamp really brightens up the corner of the living room in The Townhouse dollhouse. I stained the wood with a darker stain to offset the gold-colored tables. Donning rubber gloves, I just dipped the entire lamp based in the stain, shoot off the excess, and set it aside to dry. I then sprayed it with a clear gloss spray paint coat. The above living room table lamp is slightly larger than the two bedroom nightstand lamps below. I really like the way everything came together. 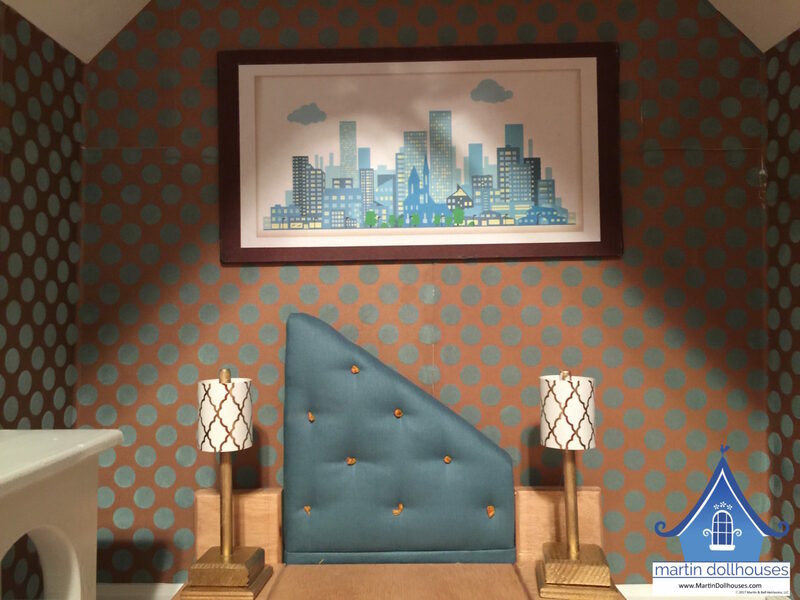 The wallpaper was some scrapbooking paper I found – the dots are ‘fuzzy’. I did a custom upholstered, wood Baltic Birch bed. 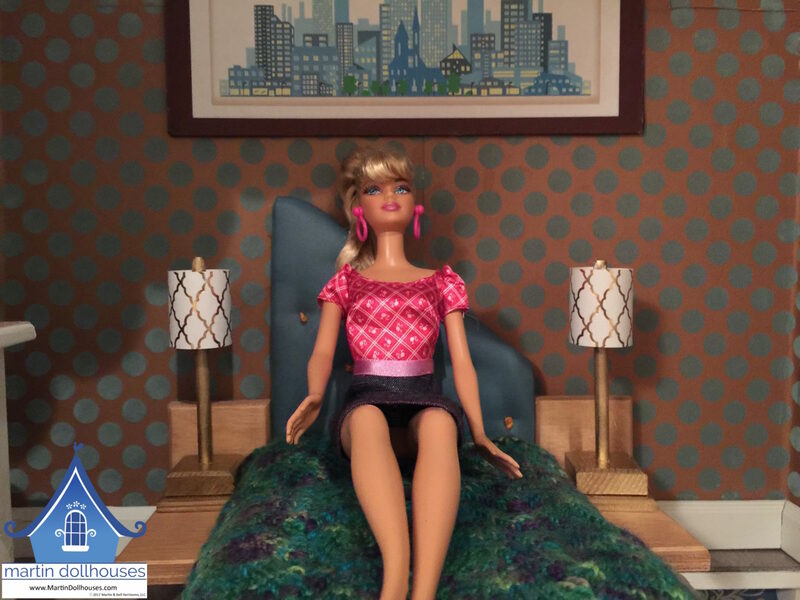 In another blog, I show how I made a removable Barbie doll bed mattress. After all, you can’t have Barbie sleeping on a hard bed. 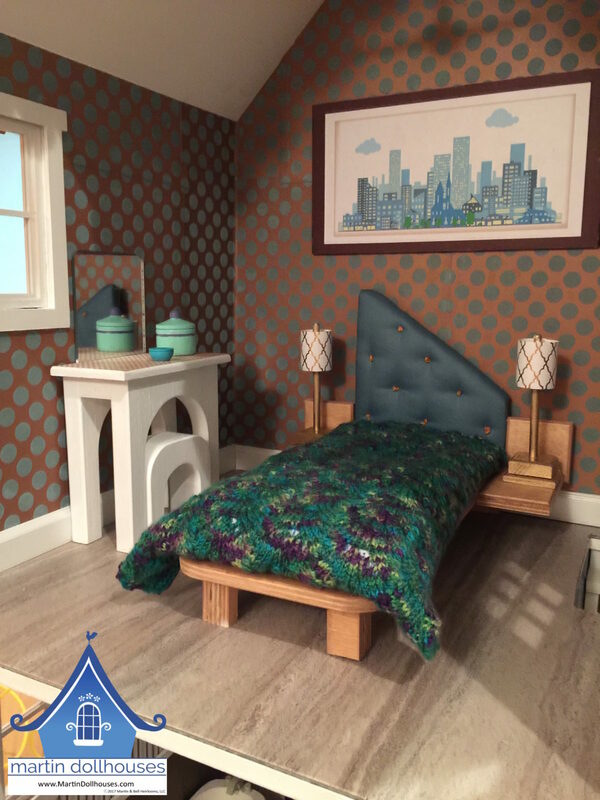 The above rooms are from a Barbie dollhouse, The Townhouse, I donated to our local high school for a fundraiser for their theater group. 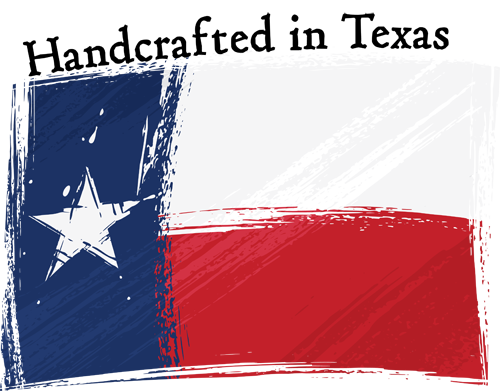 I do a few commissioned pieces each year for special events and on customer request. It only take a few hours to assemble on of my kits, but it does take some thought and time in decorating. This entry was posted in Decorating, Furniture and tagged Accessories, Decorating, Furniture.